Kenya banned the use of plastic bags on August 28, 2017. BETTER late than never, goes an old adage which fits in well as the government finally announced a ban on use, imports and production of plastic bags to join other East African Community member states in biding goodbye to the materials deemed to be harmful to health and environment. Prime Minister, Kassim Majaliwa told parliament in Dodoma last week that polythene bags will no longer be used for commercial purposes or household packaging come 1st of June this year and warned producers and suppliers to dispose of their stocks. The Office of the Vice-President will ensure the enforcement of the ban through regulations to be introduced under the environment law. The ban on plastic means that Tanzania will join the ranks of Kenya, Rwanda, Uganda and Burundi in mitigating the effects of plastic bags waste. The government conducted countrywide stakeholders' sessions last year to chart out strategies that will lead to the promotion and eventual production of alternative bags. Studies show evidence that plastic bags are not safe for the ecosystem, since they are not easy to recycle. They cause severe health hazard for human, animals and the environment. 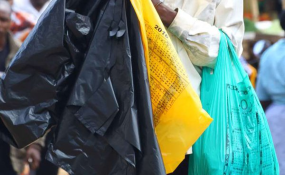 It is possible to estimate the magnitude of the problem as Tanzania produces over 56,000 tonnes of plastic bags and uses over 2 billion pieces of them a year, according to the Deputy Permanent Secretary in the Vice-President's Office (Environment) Ambassador Joseph Sokoine. What is very important we have local capacity for alternative bags. The Acting General Manager for Mufindi Paper Mills, Engineer Gregory Chogo said at a meeting which brought together stakeholders and entrepreneurs in the production of environmentally friendly bags in Dar es Salaam yesterday that his company used to export its products in neighbouring countries, including Kenya and Rwanda which use them in production of alternative bags. The local demand is only 25 per cent, according to him and they are now optimistic there will be a boost in demand from the local market following the announcement of the impending ban. We have a window of less than two months before the ban is effected and this will be an ideal time to adjust to the expected shift in the plastic bags business. We are encouraged that manufacturers and traders dealing in the merchandise as well as other environment stakeholders are charting out ways with which the ban can be successfully implemented. It is our time now to show the world we are serious and well prepared to get rid of plastic bags for the good sake of our health and environment.